A Low Profile recliner is basically just a recliner that is very low to the ground, or in easy terms a short recliner. This type of recliner can be found in any shape, type, upholstery type, or even functionality that you may require. There are options available in both Manual and Power recliners that have a lower profile. A low profile recliner has the benefit of offering better support, and being very sturdy, when it comes to its height alone. The lower height is also much easier to get in and out of, especially when you are a shorter individual. Comfortable and adjustable reclining positions for you to choose from. A retractable footrest or Ottoman for relaxing your feet on that usually has padding to provide good support. Lower profile means your legs will completely touch the ground when you sit which may be more comfortable. The lower profile may offer easier reach to side tables, your coffee table or even items on the floor. If you have children and or pets that like to climb on your Recliner and sit with you or on their own and relax, a high reclining chair can be difficult for them to get up on. Particularly toddlers who like to climb up and down chairs and sofas several times a day, may benefit from a Lower Profile Recliner, as it is easier for them and holds much fewer dangers of falling. Small dogs may struggle to jump up and down your high recliner to get on your lap, and if you are someone who loves their pets and cuddling with them, a Low Profile recliner is an ideal option. People who tend to be a tad on the short side, may also find the Low Profile recliner much more comfortable and easy to get in and out of. The Lower Profile will similarly allow your feet to easily touch the ground, which is much more comfortable when you are sitting upright, than feet that are handing in the air. The design and décor theme of your home may call for the elegance and sophistication of a Lower profile Recliner. You may already have plenty of Height in an area, and are just looking for something to break the length. Many Low Profile recliners are also small and compact so that they will save you on space. A Small Low recliner is an ideal choice for a small home, flat or even a mobile home. A Low Profile Recliner will naturally have very short wooden or steel legs, or no legs at all. You can likewise get a Low profile recliner with a steel base that is flat on the ground, or a small round swivel base. Low Profile recliners come in all sorts and styles, and there are those with power Lifting options, Swivel and Rocking Options, and Even Massage and heating Features. The JC Home Liano is a large and comfortable recliner, with plush seating and a space-saving design, that similarly has a lower profile. Comes in a neutral and soft slate grey color that will easily blend in with almost any background color or theme. 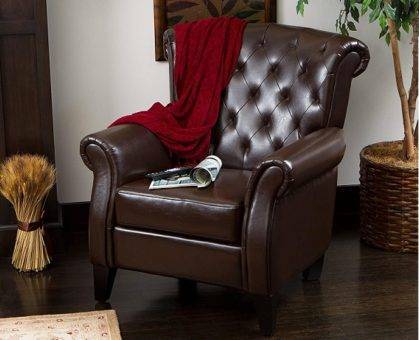 Oversized, overstuffed and plush, this recliner screamsCOMFORT, and has a very inviting appeal to it. Besides being large and wide, it still has a reasonably low profile if that is what you require. A strong and durable hardwood frame, with a very high-quality recline mechanism, for Smooth, Easy and Long Lasting recline functionality. The Microfiber upholstery is soft, luxurious and stain resistant, as well as having water repelling capabilities. A Space saving, Wall Hugger, design that only needs around 4 inches of space at the back to fully recline. There is likewise a comfortable and convenient fully padded retractable footrest to relax your feet and legs on. If you are looking for a full house spa experience in a low profile recliner, then the Waterjoy Gentleshower is your answer. 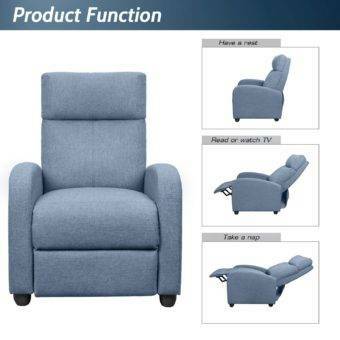 A completely remote controlled recliner Chair with heating and massage functions, as well as a lower profile build. Offers you a full body customized massage, featuring the Gentleshower massage technology. There are two intensity levels and five massage modes to choose from along with a Heating Option. In total the eight vibrating nodes and intensity levels will offer you the finest relaxation and comfort for your legs, back, thighs and lumbar area. The built-in HEATING FUNCTION, in the waist area will warm your aches and pains away and is very beneficial to your overall well being. You can toggle the Heat mode on and off, and use it when needed for healing sore muscles or improving blood circulation. There is a manual Pullback control just under the armrest, for Multiple Stages of recline, so you can choose the position that you are most comfortable in. To ensure your safety and comfort there is a, 25 minute AUTO ON and OFF feature, for the heating and massaging functions. There is a very easy to use the corded remote control for most of the functions, and a handy Side Pocket to store small items in. Furthermore this recliner has a strong and durable frame, with a well-constructed design in a lower profile. Upholstered in easy to clean and maintain leather with fine and decorative stitching details. The padding is thick and comfortable, as well as slightly oversized. Large, wide, and amply cushioned, while still flat on the ground, with a very low profile. 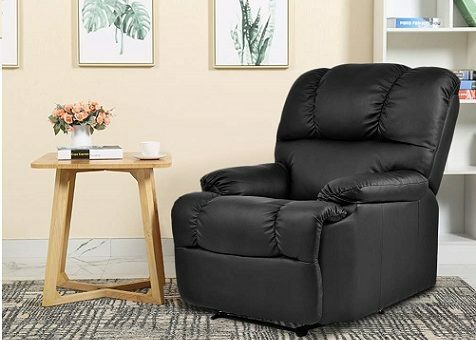 The Catnapper is one of the most popular names in recliners when you are looking for something comfortable to sink into. 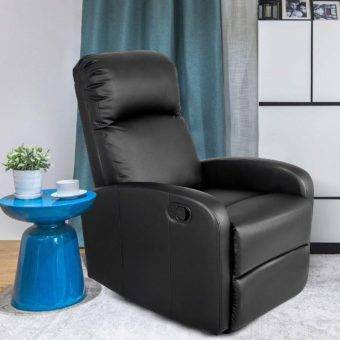 Made for the larger individual this recliner chair can hold up to 400lbs in weight, it is wide, large and overstuffed for superior plush and cushioned. Comfort. Ideally it has quite a low profile for such a large recliner which is exactly what we are looking for. The Steel seat Box will never warp or split and offers superior support. Completely Flat recline Positioning, that is excellent to sleep in. Comes in a stunning Vintage styled soft and durable upholstery. This recliner is small, compact and has a low profile, everything you need for a small area or space availability. It has a simplistic yet elegant design with full recliner functionalities. A Push Back recline Mechanism, for full comfortable recline options. It is made from Eco-Friendly, durable and smooth leather, with plush foam padding in the back, seat, armrests and leg rest. PU leather is used that is durable and very easy to clean and maintain. This recliner has a simple, yet elegant and sophisticated design, with a slightly higher back, and very neat finishing. A tough Steel mechanism, that is long-lasting and highly reliable. Comes in a neutral black color that is ideal for blending in with any color or style of home décor. The perfect size and shape for smaller spaces. The Jummico recliner Chair is a small and compact, low profile Sofa that has a thick and comfortable seat cushion, and full recline functionality. Available in light and neutral Blue, Grey and White Fabric upholstery color options. A durable and hard-wearing STEEL frame, that improves stability. The retractable Footrest, is fully adjustable and comfortably padded. High quality, breathable Fabric Upholstery. The seat is extra thickly cushioned for comfort and support, and the backrest and armrests are well padded. There is a comfortable extra-padded Headrest, to support your head and neck fully. A low profile, and small yet still highly comfortable and graceful design.